Naples Florida is a beautiful area. However, a beautiful town is not exempt from having driving hazards that can cause damage to your windshield. There are numerous situations in and around town that present ways in which your auto glass can be broken, chipped or cracked. 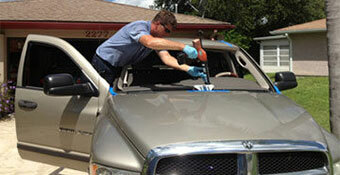 The Auto Glass Warehouse wants to be your number one local shop for all of your Naples windshield replacement needs. We have technicians that are local to your area. They will even come to you to do your auto glass replacement at no extra charge. Our technicians will provide our free mobile service to anywhere your vehicle may be. They will require a 2 hour window in which to arrive to do your repair or replacement. 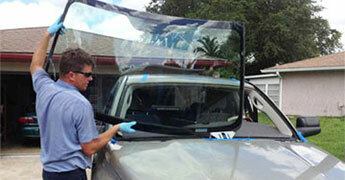 After arriving, most Naples windshield replacements will take between 30 minutes to 1 hour. Windshield repairs will take less time, as there is less set up. Sometimes, there are circumstances that can lengthen the amount of time it takes to do your windshield replacement. Our technicians will do their best to inform you if such an instance should arise. If you are concerned about the length of time, please inform our staff when you place our appointment and we will do our best to accommodate you. No matter what the reason your windshield was damaged, the Auto Glass Warehouse is here to provide you with a precise, quality auto Naples windshield replacement. Your satisfaction is guaranteed. We are not happy until you are. If you have any questions during or after your Naples windshield replacement or repair, our technicians will be glad to answer them for you! The best way to avoid windshield damage is to be an observant driver. If you notice a construction vehicle driving in the distance, switch lanes to avoid driving behind it. If there is construction in your area, consider finding an alternate route until it is finished. Drive around potholes instead of over them. When possible, refrain from traveling on gravel roads. All of these circumstances could have adverse impacts on your windshield, including chips, cracks, breaks or shattered. Also remember to be cautious of heating or cooling a windshield too quickly. Some instances of this would include: blasting your heat too high or too quickly on a cold day or turning your ai r conditioning on high immediately upon entering your vehicle after it has been sitting out in the heat of the day for an extended period of time. Drastic temperature changes can create enough stress on a windshield that it can crack.